FEMA, USAR, WMD, HAZMAT, Fire and Rescue teams, this is what you've been looking for! 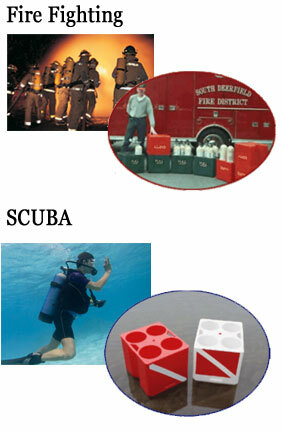 TANK-TENDER is a container system for the storage, transportation, organization and protection of Self Contained Breathing Apparatus (SCBA), OXYGEN (O2) and SCUBA tanks. Transport your equipment safely! 2 pieces (FULL/EMPTY), ruggedized, durable, roto-molded plastic. Size 30 min 4500 psi 16"x17"x25" high 18 lbs. empty. Size 30 min 2216 psi 16"x17"x30" high 20 lbs. empty. Holds up to five 30 min 4.5 SCBA bottles or four 2216's - fits all major SCBA brands. SCUBA holds four 80 cubic ft tanks (18"x21"x17" each, 18"x21"x34" a pair). Protect your valuable breathing air equipment. Also available in custom colors and graphics!